Drum brakes are imperative to slowing down and stopping vehicles in older automobiles. Brake drums have been replaced by rotors on most cars built after 1998, but can still be found on the road today in older designs. They work in a similar fashion by creating friction between the pads and the drums to slow the rotation of the wheel which will stop the vehicle. As the drums wear down from heat and contact they will lose their effectiveness and resist motion less effectively. Replacing the iron brake drums is expensive as there is a significant amount of labor involved, and the parts themselves will cost on average $100. The full brake drum replacement cost averages between $250 and $350. The price may vary, as front and rear drum brake replacement costs will involve different parts and labor times. Although you might not want to spend this much money, this service very important for the safety of your vehicle and passengers. 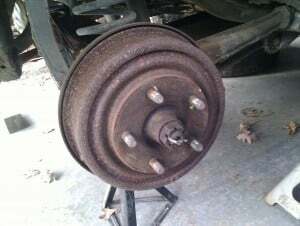 Drum brakes follow the same principle as disc brakes since they apply pressure to a piece connected to the wheel in order to slow momentum. The harder you press on the brake pedal, the more friction is applied to the outside drum, and the more rapidly the wheels of the vehicle will slow down. But where disc brakes can be likened to a clamp that closes down and slows momentum, drum brakes have the actual breaking mechanisms on the inside, which allows for much more friction to be created and a more efficient means of slowing your vehicle. Imagine a thick, spinning metal ring. If you were to pinch the ring with a few fingers, it would gradually transfer the momentum of the ring to your fingers, which would slow the ring at a rate dependent to how hard you pinch. Now imagine that same ring, but instead of pinching it you’re putting your hands on the inside and pushing outward. That is the difference between brake drums and disc drums in about the simplest terms possible. Brake drums are easier to manufacture, more efficient in terms of stopping power, and easier to install than disc drums. They are also a bit more complicated in terms of maintenance, however, and can be a bit intimidating when first inspected. If you aren’t comfortable replacing brake drums yourself, you can always head to a dealership or mechanic and pay to have it done. The average national cost is between $233 and $338 for the entire process. This includes $171 to $217 in labor, and $62 to $121 in parts. Hopefully you can get a rough idea of the expected price when it comes to getting it down at a shop and doing it yourself. The price discrepancy is pretty wide between parts and labor, so if you have access to an owners manual it may be more cost efficient to do the repairs on your own. Replacing drums on your own is a difficult task and should be handled with great caution or by a professional. The typical piece that will need replacing on a set of brake drums are the shoes and the drums. The shoe is the inner piece that pushes outward onto the drum, creating friction and slowing your vehicle. These two pieces are what absorb the energy of the moving wheel, and will obviously need to be replaced every once in a while. If you notice that there are grooves in the drums or they are starting to wear down a bit, it is highly recommended to at least get them inspected by a professional. These service stations can help you determine whether they need to be replaced or not. Occasionally, you can simply resurface the drum which is much less expensive then a full replacement. You can only do this a few times though before the drum itself has reached its minimum thickness and is no longer acceptable for use. Any mechanic will have a brake drum micrometer which is used to measure the drum thickness and can be determined in a few minutes. You will also want to keep in mind that if you are wearing down brake shoes faster than expected, the drum might be the culprit. A rough surface can quickly damage brake shoes significantly, reducing their expected useful life. Replacing both the shoes and the drums themselves can be a relatively complicated task, depending on the make and model of your vehicle. But the overall premise is that after jacking up the vehicle and removing the wheels, the drum will be exposed. Held in place by either a screw or a small clip, the drum rests on the axle of the vehicle and can be stuck in place by corrosion and dirt. If the drum is all that needs to be replaced, using a rubber mallet and some penetrating oil can typically get it removed and make room for a replacement. If the drum is still in working condition, however, the shoes are the next step. Held in place with springs, the best way to get these particular pieces out is to follow the owners manual. There are a wide variety of brake drums on a wide variety of vehicles, and while the general premise remains the same for all of them, the individual construction may vary. One of the most important things to consider is that when you’re taking apart your brake drums, you’re essentially working with a puzzle. Taking pictures during the process can help significantly if you don’t have access to an owners manual, as putting it back together is extremely complicated.